Drying rack... The hygienic solution for a common problem. A dish washing brush and a cloth are fundamental dishwashing tools that no kitchen can afford to lack of. After their use, they are left right next to the sink, completely wet, deteriorating quickly. Rosendahl has the perfect solution! 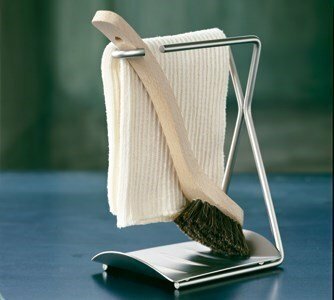 A practical accessory where you can hang the washing cloth and brush, so that they can easily dry up till next time. Have your washing tools always available, dried up and clean! Brush and cloth not included.